Tennis for Bayou Club Members is integrated with our sister club, Bardmoor Golf & Tennis Club, at the Harry Hopman Tennis Center. 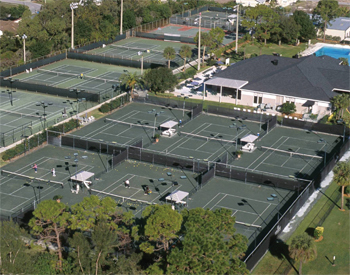 For decades the Harry Hopman Tennis Center has enjoyed a fine reputation as one of the best tennis facilities on the west coast of Florida. That distinction continues today with top rate USPTA & USPTR instruction and 16 Har-Tru clay and hard courts which provide an exciting and challenging tennis experience. Legendary tennis instructor Harry Hopman, whose clients included Rod Laver, Ken Rosewall and John McEnroe, trained many of his students here for years. The courts also served as the host site for the WTA Eckerd Open tennis tournament. Bayou Club Members enjoy tennis programs for all ages led by USPTA Certified Directors of Tennis Merissa Rock and Damon Henkel. Both are award-winning players and instructors with impressive resumes. 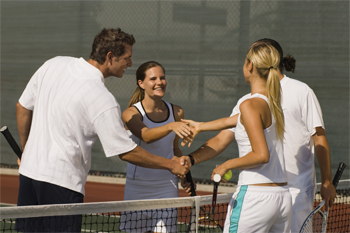 Merissa and Damon's team of USPTA professional instructors offer lessons for every caliber of player, whether you want to improve a stroke or just pick up the basics. Group clinics as well as private lessons are avalaible. The junior instructional program is one of the finest in Florida and is offered year-round. Several nationally ranked junior players have come from of the Harry Hopman Tennis Center.